(Nanowerk News) Our world is full of patterns, from the twist of a DNA molecule to the spiral of the Milky Way. 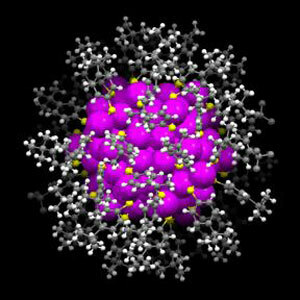 New research from Carnegie Mellon chemists has revealed that tiny, synthetic gold nanoparticles exhibit some of nature's most intricate patterns. Unveiling the kaleidoscope of these patterns was a Herculean task, and it marks the first time that a nanoparticle of this size has been crystallized and its structure mapped out atom by atom. The researchers report their work in the March 20 issue of Science Advances ("Structural patterns at all scales in a nonmetallic chiral Au133(SR)52 nanoparticle"). With this latest research, Jin and his colleagues, including graduate student Chenjie Zeng, have solved the structure of a nanoparticle, Au133, made up of 133 gold atoms and 52 surface-protecting molecules--the biggest nanoparticle structure ever resolved with X-ray crystallography. While microscopy can reveal the size, shape and the atomic lattice of nanoparticles, it can't discern the surface structure. X-ray crystallography can, by mapping out the position of every atom on the nanoparticles' surface and showing how they bond with the gold core. Knowing the surface structure is key to using the nanoparticles for practical applications, such as catalysis, and for uncovering fundamental science, such as the basis of the particle's stability. During production, the Au133 particles self-assemble into three layers within each particle: the gold core, the surface molecules that protect it and the interface between the two. In the crystal structure, Zeng discovered that the gold core is in the shape of an icosahedron. At the interface between the core and the surface-protecting molecules is a layer of sulfur atoms that bind with the gold atoms. The sulfur-gold-sulfur combinations stack into ladder-like helical structures. Finally, attached to the sulfur molecules is an outer layer of surface-protecting molecules whose carbon tails self-assemble into fourfold swirls.